Engage guests with real time, targeted messaging throughout your casino. WiFi technology. Elegant design. Powerful promotion. The culmination of decades of experience and innovation from Carmanah Signs, the developer of the original LED-lit Table Limit Sign. Prepare, select, and schedule content with ease. Customize LED-lit faceplates, laser cut to any shape, and easily replace to reflect casino branding and promotions. Draw players to your tables and create a unique atmosphere in your casino. The sleek design of this Petite LED Table Limit Sign takes traditional LED Table Limit Signs to the next level. Our most compact Table Limit Sign, the Petite LED Table Limit Sign will add style to each table while allowing clear sight lines throughout the pit. Guide players to their favorite games. Highlight specialty games. Add character to the casino floor. The global leader in Table Game Signage, Carmanah Signs creates completely customizable Double Sided LED-lit Table Game Signs. Send us your logo or ideas, and we'll create complimentary graphics for your casino’s custom signs. 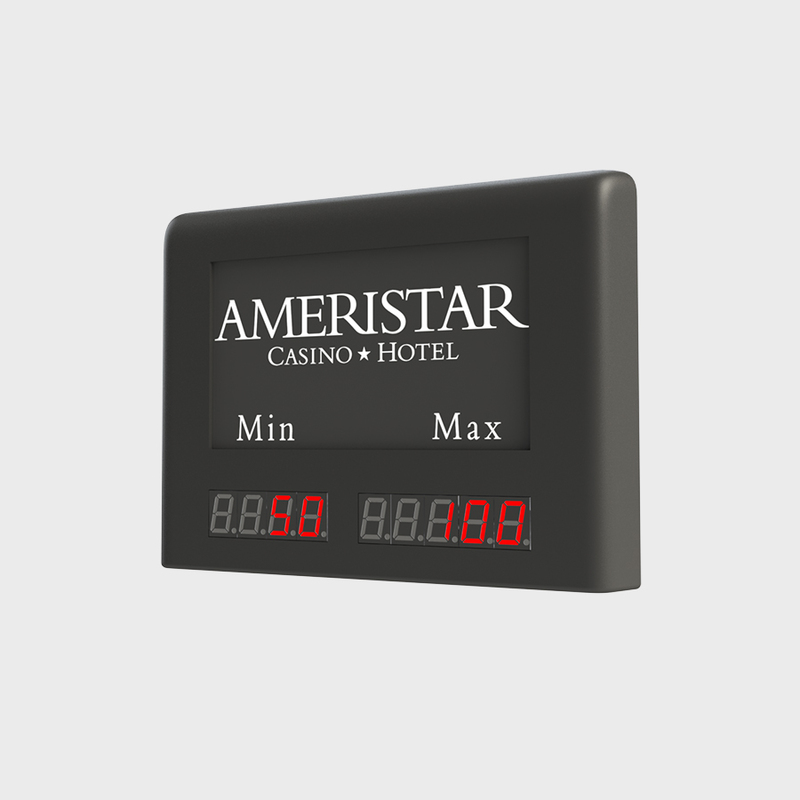 This compact take on the classic LED Table Limit Sign adds elegance to the craps table, perfect for use with branded signs on each side of the craps table. Low profile control box easily mounts under the table and out of sight, with three button control making it simple to control lights and minimum/maximum values. Carmanah's original, time tested jackpot signage. Fully-lit frameless LED display with maximized graphic area. Progressive jackpot values. Proven wireless communication. Ultra lightweight aluminum construction allows for easy installation and maintenance. Quick and easy to update. 6 or 9 digit options available. Engage players with networked digital signage. Promote games and events. Offer user-friendly interactive way-finding. Empower players to search for slot machines, restaurants and bars, entertainment schedules, and poker room wait lists. Create limitless opportunities for social gaming, learn-to-play apps, self-serve food and beverage, and access to reward program registration and virtual concierge services.